You will agree with me that after a good meal we all crave for a sweet, a refreshing and light dessert. The traditional Mediterranean Sweets are mainly about fruits and fruit varied desserts accompanied by yogurt, honey, nuts, almonds and more. Moreover, every household keeps homemade jellies and jams, syrupy sweets, halvah, and more. And the good thing is that especially during the spring and summer months, the flavors and aromas of Greece, -which in most cases are unique in the world-, give us the opportunity for endless tasteful and healthy combinations that will enchant our senses! For instance the traditional syrupy custard filled pastry gets new presence together with ginger and citrus sorbet and we give panna cotta flavor and aroma with fresh sour cherry syrup and our unique Chios Mastic gum! There may be hundreds of different sweets and desserts around Greece and other Mediterranean areas, some of them healthier than other and it would be a matter of a whole book (with many tomes) to try to list them all. On the contrary, we will list here some well-known traditional and homemade Mediterranean sweets, along with their beneficial attributes for our health and of course, exceptional taste. 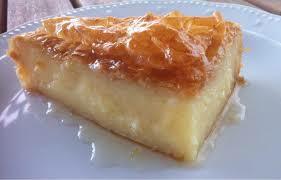 Then, we will provide you with a fast, tasty and healthy recipe for a traditional refreshing dessert. Vanilla – Spear: One of the most cherished and traditional flavors of the Greek summer lies in classic mastic gum cream with vanilla flavor. The unique aroma, great taste and velvety texture combines with cold water to perfectly accompany the hot summer afternoons. The lemon which contains puts it in the category of foods that give us vitamin C and antioxidants, which neutralize free radicals in the body and prevent various cancers. Chocolate Mosaic: The chocolate mosaic or otherwise chocolate sausage is an old favorite, easy to make and delicious sweet. It is prepared from whole-wheat biscuits, which contribute to the increased fiber benefiting the functioning of the gastrointestinal system. Another nutritional advantage of the mosaic is the high content of cocoa and dark chocolate which in turn give a high content of antioxidants (flavonoids) that neutralize free radicals, thereby improving blood flow and prevent various cancers. It is rich in potassium, magnesium, calcium, iron, vitamins A and E as well as healthy fatty acids. The recipe includes nuts which further increase the content of antioxidants. Syrupy custard filled pastry (Galaktoboureko): The custard belongs to the class of fatty sweets and the materials used in the preparation are quite nutritious. The main ingredient of Galaktopourekko is milk, so it is rich in calcium and phosphorus, which play a key role in the structure of bones and teeth, potassium which helps regulate blood pressure, and B vitamins, necessary and beneficial for our health. Thanks to the eggs used, Galaktoboureko contains vitamins A and D, as well as iron and lecithin, which helps in mental functioning. The lemon zest and lemon juice give the sweet vitamin C, which helps in better absorption of iron and antioxidants that prevent aging. 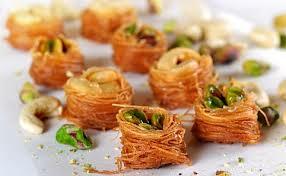 Almond sweets: The almond-shaped sweet is a traditional sweet in Greek islands and is made ​​mainly by almonds. The content of the fat is almost zero, since the only fat it contains is derived from almonds and is polyunsaturated, not harming our health. Rich in calcium, phosphorus, potassium and vitamin E -which is an important antioxidant- almond sweets protect our body from various degenerative diseases and contribute to reducing the rate of cell aging. They also contain magnesium, which helps maintain good bone health and fiber that helps proper bowel function. Almonds also reduce levels of ‘bad’ cholesterol (LDL), which is considered responsible for the occurrence of cardiovascular diseases, while they increase “good” cholesterol (HDL). Sesame halva: Despite the high caloric content of the various types of halva, its nutritional value is high, since it is prepared by the beneficial, tahini. Contains polyunsaturated and monounsaturated fatty acids, the so-called necessary fatty acids, which benefit brain function and improve cholesterol levels, keeping our hearts healthy. Sesame halva contains dietary proteins of high biological value that are essential to our body as building blocks for muscles, organs and tissues. It is rich in B vitamins, necessary and beneficial for our health and also contains vitamin E, which has antioxidant activity. It is rich in minerals and trace elements such as calcium, magnesium, selenium, phosphorus and zinc, which strengthen bones, help in better absorption and induce the action of vitamins, protect the heart and more. When made ​​from whole sesame seeds, it contains increased fiber, benefiting the functioning of our digestive system and keeping us fuller for longer. If you want, you can combine the halva with fruit (dried or fresh), nuts such as almonds (rich in calcium) or walnuts, yogurt, etc. Fruit jelly-jam: Jellies and jams can meet our need for sweet with very low calories. Jelly’s fat is zero and the caloric content extremely low, especially if you choose fruit jelly without sugar. We can add pieces of fresh fruit to increase the nutritional value. Fruits will give us vitamins and antioxidants, which offer health and wellness in the body. There are dozens of fruit jellies and jams beyond the standards, such as fig jelly, chestnut jelly, quince jelly, watermelon jelly and many, many more homemade jams and jellies that one can taste touring the Mediterranean Area and Mediterranean Countries. Fruit compote: The compote is prepared from fruits very easily by baking or boiling them in water with a sweetener and little flavoring. We can prepare it with whatever fruit we like in order to get enough nutrients and few calories. All compotes differ in antioxidants, natural sugars and fiber they contain, depending on the fruit origin. In order to see for yourself and taste a bit of Mediterranean sweetness, here is a healthy, quick and pure traditional Mediterranean recipe for a refreshing, light and tasty dessert. Enjoy! Wash the apples, cut them in half keeping the peel and removing the seeds. Moisten the cut surface with lemon juice to avoid browning. Put them in a pan with the cut side up. Mix the almonds with the brown sugar and the cinnamon. Divide the mixture to the apples and pour into the pan the cloves, the allspice, the star anise and the 1 cup of water. Cover the pan with foil and bake the apples in preheated oven at 200 °C for 30 minutes. Empty whatever liquid is left in the pan to a bowl and let the apples cool until serving. Dimitris Petsios - Nutritionist-Dietitian who has an Msc degree and he is a member of the practicing Dietitians-Nutritionists association. Dimitris has its own website in Greece, www.dia-trofis.gr that you may visit.